A quiet game became one sided as the floodgates opened in the top half of 5th inning for the first place Matadors. 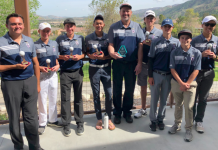 The final of Saturday’s Grossmont Valley League showdown was 8–0 in favor of the visiting Mount Miguel Matadors over their cross-town rivals, Monte Vista Monarchs. 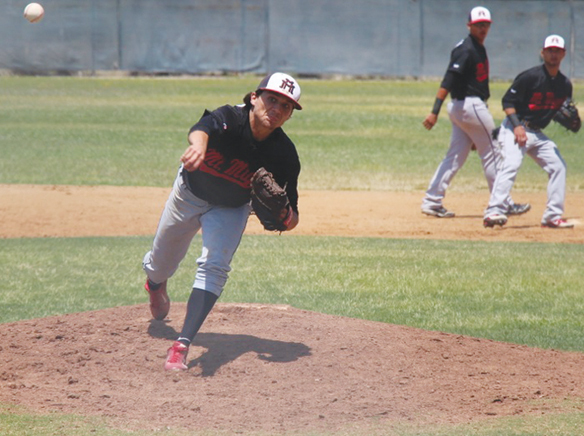 Matador ace pitcher and leadoff hitter, Brad Moreno was a jack-of-all-trades. He contributed to his cause on the mound by reaching base safely three times and scored in each of those opportunities. Until the 5th inning, the game had all the making of a classic pitcher’s duel. Monte Vista’s Austin Caole was stingy through the 4th, limiting the Matadors to just 1 run. This style of play 180ied abruptly with a rally sparked by the bottom half of the Matador lineup. The 5th inning started with consecutive walks, setting the stage for a 2-run RBI double by Matador center fielder, De La Rosa. A single by Moreno kept the momentum moving forward, who scored later on an RBI double by 3rd baseman, Keller. The Matadors didn’t settle as they scored more insurance runs in the 7th. These runs could be considered overkill as Moreno’s above average fastball with late movement, complimented by a sharp breaking curve, kept the Monarch hitters guessing. He finished the day with seven strikeouts in six innings pitched. Mt. Miguel came into the day at a near three-way tie for first in their division with Santana and El Capitan. With the season coming to an end, every conference win is valued. 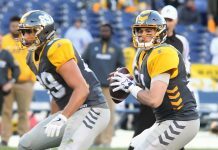 The Matadors have a tough challenge ahead of them with their next conference match-up against the Vaqueros of El Capitan, but are confident that they can challenge for the division crown.